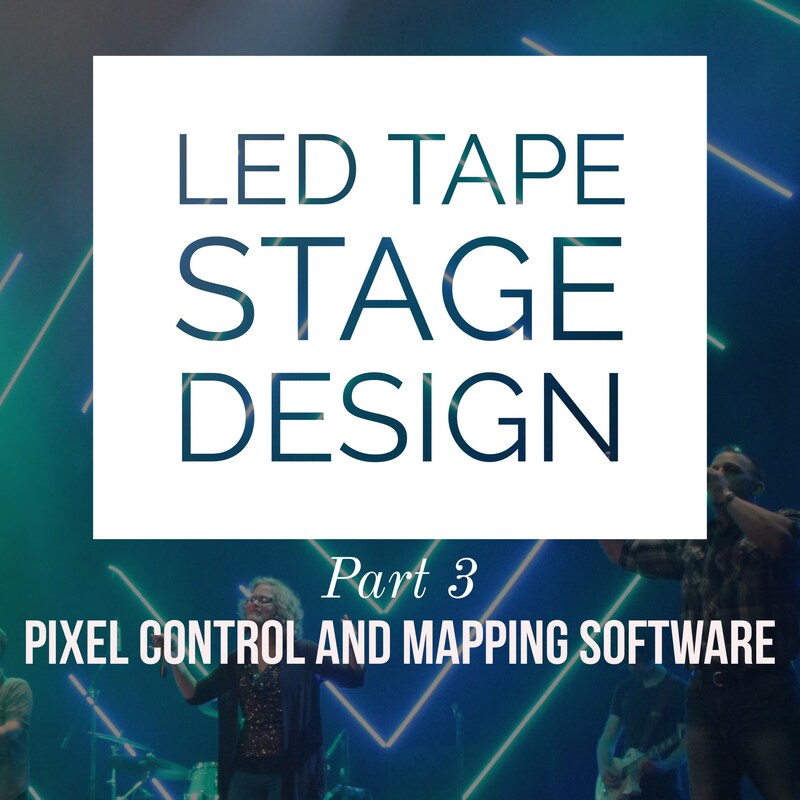 As I mentioned briefly in part 2, you’re most likely going to need a program that can map media and effects to your pixel tape controller, likely via Art-Net, sACN or KiNet. I’ll look into some specific programs to compare in a second, but generally these programs allow you to create a stage configuration that has some sort of spatial mapping relative to how your pixels are installed in the real world. Some even support 3D mapping as well as basic 2D stages. This virtual stage can then be used to map effects or videos in a way that essentially turns your pixel tape into a giant screen. From there you can create presets that can typically be launched via network-based cues, likely via Art-Net, MIDI, or HTTP. There are a number of free, open-source LED pixel mapping options available, but we really wanted something we knew would be stable and have some commercial support, so I didn’t look seriously at those options. There might be some great ones out there if your budget is limited! Pricing For most LED mapping programs, pricing is based on the number of DMX universes needed. For example, E.L.M. is $125 for 4 universes, but $5,000 for 1024 universes. You can also typically mix and match licenses: we needed to cover 22 universes for our 3,700 RGB pixels, so we ended up buying two E.L.M. standard licenses ($250 each) for 32 total universes of control. I actually downloaded, installed, configured, and spent time with MadMapper, Madrix and E.L.M. before our tape even arrived. I’m working in a church environment with volunteers, so although I do most of the programming it’s very important that our system be easy enough to use that an untrained volunteer can make it work. To that end, I knew I’d want an pixel control system that could be remotely operated by Jands Vista, our primary lighting control system. Jands Vista supports Art-Net, so any of the three options I tested should integrate nicely: I simply program LED wall media into Jands cues, and the volunteers don’t even need to learn anything new to operate the wall. We have an on-staff video production person, so although a program with good built-in effects is nice, we can also build our own if needed. For our system, I was really looking for pixel tape control only. I don’t foresee us using this system to do video or projection mapping or controlling any other fixture types. It’s really a dedicated pixel-wall-only solution for our installation. I was open to Mac or PC support, so that wasn’t a major consideration for us. To be honest, I really wanted MadMapper to work. I’d seen it used in other environments and at a first glance it looks like a very cost-effective, expandable, flexible solution. Unfortunately, it was really difficult to use for our application. It really seems like although MadMapper supports pixel tape, it’s really built more for projection mapping. A lot of the configuration and features are designed with that in mind: surface mapping and bezier shapes and other things that really didn’t apply to our installation. Although MadMapper did have quite a few built-in effects, they didn’t seem very customizable from what I saw. After comparing MadMapper to Madrix and E.L.M. it just didn’t feel like it was designed for what we needed. Changes and effects felt clumsy and difficult to use, and the effects weren’t anything special. Madrix was awesome to work with. I felt like the UI was very intelligently laid out and I really appreciated the previews. Neither MadMapper nor E.L.M. showed decent per-pixel previews of effects, so it was really difficult to get a sense of what an effect or video would look like without actually being in front of the installed wall. Having said that, it did take a while to get the wall mapped in Madrix. I think it’s just because Madrix is designed for larger, more complex 3D pixel installations, and as features grow UIs become complex. I did eventually get it mapped though and in the end it was more a matter of me learning the UI, and I could likely configure our wall again much more quickly once I had a bit of time invested. I loved Madrix’s built-in effects. There are a lot of template options and each of them have lots of possible configurations and customizations. Madrix also supports video mapping, but I think Madrix’s built-in effects would save a ton of time making custom media and effects. If cost wasn’t a consideration we would’ve gone with Madrix. For our 22-universe installation we would’ve needed an “Entry” license along with a “Basic” license, which would’ve cost us $3,000 (instead of $500 for E.L.M.) That would’ve been almost 50% of our project’s entire budget! Mapping our LED pixel tape installation onto a stage in E.L.M. was absolutely intuitive and straightforward. It took me far less time to get this set up in E.L.M. than in Madrix or MadMapper, which is likely partly the result of E.L.M.’s limited support for other features: it’s built for pixel tape installations like ours. As mentioned, this is E.L.M.’s weak point: it has some built in effects templates, but they are extremely limited. For one example, there is a sort of rainbow effect you can play across your stage, but no way to really customize the colors used in the effect! From my point of view this is a real disappointment, but I was able to work with what it had and–as mentioned–build video-based effects when needed. I really appreciate the way remote control is set up in E.L.M. It allows you to control a pretty good range of features remotely over a number of Art-Net channels, not just firing presets built in E.L.M. itself. For example, I can select a particular effect, set a color and speed, and customize a transition all from our Jands Vista console, without needing to actually open up E.L.M. at all. This saves a lot of time programming and building very specific presets on E.L.M. like I would have to do if I was using something like MadMapper. This allows me to easily re-use a small number of custom-built effects throughout an entire show very quickly. Ultimately we ended up using E.L.M. I am still quite disappointed with the built-in effects, but because we can build our own videos if needed I felt that the cost and ease-of-use outweighed the limited effects templates in our scenario. It’s been incredibly reliable and responsive for our installation and I’m happy with our decision. However, if creating custom videos isn’t an option for you, or if you’re looking for something more powerful I would definitely recommend you seriously consider Madrix instead of E.L.M. Hey hopefully you’ll see this. I just had a question about ELM that I can’t find anywhere online. What distro/controller did you use with ELM? The Pixelator is out of my budget so I got a third party controller without knowing if it’s compatible. Hey! I’m afraid we went with the Pixelator–they work great together as a complete system so for the scale of our project we felt it was worth the cost. What controller did you get? E.L.M. supports outputting sCAN, ArtNet, and KiNet, so as long as your controller supports any of those protocols you should be able to get E.L.M. to talk to it. Thanks for the reply! Oh yeah it’s a great system just expensive. I actually reached out to someone who builds custom controllers for a lot cheaper than a pixelator. His controller takes ArtNet and sACN so hopefully ELM is universal enough to work with something that’s not Enttec. Awesome! Yeah, you should be fine then! Just make sure you have an E.L.M. license that supports the number of universes you’ll need for all your LEDs.